There are two major things here and, to brace you, it probably means extensive re-writes. The first major issue she had was that the goal/conflict of the book were unclear. The second is the organization of the book. And, as much as it pains me to admit it, she’s absolutely right. 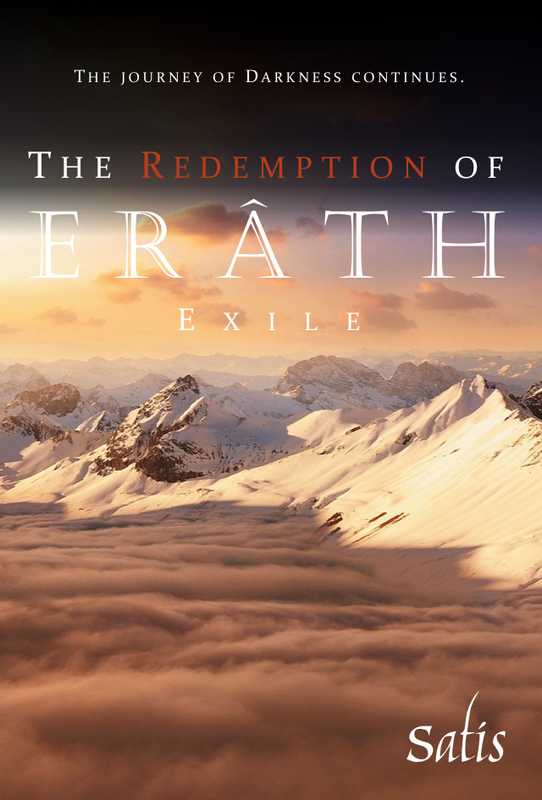 The thing is, The Redemption of Erâth: Exile was a difficult book to write, and is a difficult book to fit into the series. It’s basically a great, big transition between the small world of Consolation that Brandyé knows so well, and the greater world of Erâth that is, essentially, a mystery to him. We are introduced, along with Brandyé, to new people, new cultures and new worlds, and throughout this journey he is unsure what his purpose is among all of it. In Consolation, he was basically a big fish in a small pond; now he’s a guppy in the Pacific, so to speak. With Book Three, Ancients and Death (which, as some of you know, I’ve already started to write), the goal becomes much clearer. The role of certain characters becomes clearer as well. But in Exile, everything is a bit of a mystery. It’s an adventure story, a little bit like The Hobbit is compared to The Lord of the Rings. And this is the problem. I know, as the author, what’s important in the story and what will come back in future books. You, as the reader, don’t. And I need to make things clearer. Brandyé is captured by a race of men known as the Cosari, and lives as a slave and servant among them for several years. Eventually be befriends one of them, a sea captain by the name of Khana. After a disastrous sea battle, Brandyé is set free with a fond parting gift from Khana. Traveling now alone through an unknown forest, Brandyé encounters first an odd old man named Ermèn, and then old friends: the Dotterys. He learns of the fate of Consolation and the Fortunaé, and learns about himself and the Darkness within him. He vows to set out to discover the wider world of Erâth and fight against Darkness, and Elven agrees to accompany him. Set upon by fierundé, Brandyé and Elven are rescued by a mystical race of beings: the Illuèn. They spend some time with them recovering, and learn much of the history of Erâth, confirming that which Brandyé’s grandfather had once already told him of: there was many ages ago a great war of Darkness, and the banished Duithèn, race of Darkness, are now beginning to return. Setting out from the Illuèn, now accompanied by one of their kind named Elỳn, Brandyé and Elven come across their first great kingdom of men: Erârün. They are captured by a knight named Tharom Hulòn, but released when the king of Erârün realizes they are in the company of the fabled Illuèn. At Elỳn’s behest, Brandyé joins Erârün’s soldiers, and is soon dispatched to the northern borders of Erârün, there to defend their people against the oncoming forces of Darkness. After a terrible defeat against the newly amassed armies of Darkness, Brandyé flees to the mountains with Elven. Here they are taken in by another kingdom of men: the Hochträe. The Hochträe are the only people of Erâth not yet under the influence of the Duithèn, and here Brandyé and Elven see the sun for the first time in years. Despite their hospitality, Elven and Brandyé begin to argue about their journey forward, and eventually they part ways: Elven returning to the people of Erârün, and Brandyé moving ever further north in an effort to find Namrâth: a weapon that may help in defeating the Duithèn. So how does this all line up? The introduction is, clearly, Brandyé’s time with the Cosari. Is a fifth of the book too much to dedicate to the introduction? Hopefully not the way I’ve rewritten it (I’ve now edited the first five chapters, and am about to five into the sixth). The Cosari are vital to the story, and will return in later books. Promise! Setting up the conflict? As my editor points out, the book’s main conflict is Brandyé’s struggle against Darkness—both internally and externally. This comes about during his conversations with Ermèn and Elỳn, but perhaps I can make it a little stronger. False win? His light-heartedness with Elven. Midpoint? The time spent with the Illuèn. I think this is actually pretty strong. I don’t have a part where Brandyé realizes his mistakes, though—this could definitely be worked in. Black moment before the end? I don’t see this in the story, actually—if anything, Brandyé becomes more resolute at the end of the book, although this does tie in well with the final point she made. So there’s some work to be done, definitely. However, the first five chapters, I think, will have been the hardest: they were the weakest part of the book, in the sense that, in the words of my editor, “they didn’t seem to matter”. I’ve added a goal within those first few chapters—especially in chapters four and five—which I hope gives Brandyé a little bit more reason to have spent so much time among the Cosari before setting out on his journey. For those of you (I’m looking at you, Neil!) who have read through Consolation in its published form and the rough draft of Exile, what do you think of the above changes? I want Book Two to be as strong as possible, but I don’t feel like I can wantonly cut out the Cosari or the Hochträe (both suggestions by my editor), as they will become increasingly important in future books.